Valiant is proud to present an advance preview of Bloodshot #3, from acclaimed writer Duane Swierczynski and the blood-spattered artistic team of Manuel Garcia and Arturo Lozzi! Bloodshot is on the run, but the voices inside his head only have one destination in mind – home. Is the woman that he finds there the wife that he’s been dreaming of – or the gateway to a much larger mystery? Plus, what horrors did Project Rising Spirit unleash on the town of Atlee, Nevada? And can their latest experiment take out Bloodshot before he catches up to the men who made him into a billion-dollar weapons project? There’s a new villain waiting in the wings, and she’s about to inflict more damage than any gun, bomb or missile imaginable. Introducing Pulse! Heroes aren’t born. They’re built. Upgrade to the next level of the Valiant Universe when Bloodshot #3 goes on the offensive this September 5th – in stores the same day as Archer & Armstrong #2! 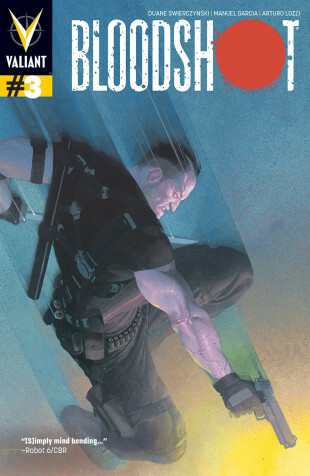 BLOODSHOT #3 – ON SALE SEPTEMBER 5th!